Crown Bingo have a special treat in store for their members this month with two big money games as part of their special Easter promotion. On Sunday 4th April, Crown Bingo will have a massive £22,000 jackpot up for grabs in the big game which kicks off at 10.30pm. Tickets cost just 50p so treat yourself to a few of them instead of an egg! If you’re lucky enough to get a Full House you’ll take away £12,000, £6000 for two lines and £4000 for a one line win. Don’t worry if you know you’ll be busy this Easter Sunday and might forget about the game, you can pre-buy your tickets to make sure you don’t miss out! And there’s more! If you love your chat games take part in the special Easter chat games in Room 2 which run between 11am and Midday and 8pm and 9pm and you could win some fantastic goodies! There are mouth watering Hotel Chocolat treats such as their Easter egg sandwiches, chocolate bunnies and yummy dark chocolate eggs bursting with sticky toffee! For those of you who love Lush bath treats there’s Happy Easter gift sets, Happy Chick, Honey Bun and Fluffy Egg ballistics up for grabs! 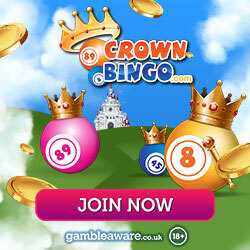 Crown Bingo has plenty of fab prizes to give away with ten prizes available every day over the Easter weekend. The CM on duty will draw each prize from the virtual hat once there’s a winner for each Easter chat game. If you like the sound of some tempting chocolate or an indulgent bath treat all you need to do is play bingo and chat away with your fellow roomies, easy! Crown Bingo give all new members £5 free bingo no deposit required when you register for an account so if you’re not a member join today and take advantage of this offer and you’ll also get 100% cash match on your first deposit up to a huge £250!